Euro NCAP is celebrating its 20th anniversary this year and is thus reaching an important milestone. More than 78,000 lives have been saved since the introduction of Euro NCAP’s demanding safety crash tests in 1997. For the organization’s twentieth anniversary, we were asked to offer viewers a unique perspective of Euro NCAP testing. A special shoot where our camera was placed in the car during one of the iconic crashes. "If every crash test were like that, it would be great"
The preparation was crucial to ensure that usable images were delivered and that our camera would (preferably) survive the crash. 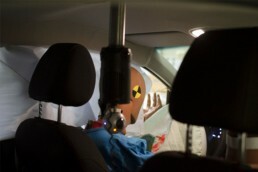 Together with the Euro NCAP team, we made a robust installation for the various tests. In addition to the wall crash, a second test was conducted in which the automatic braking system was tested. A dummy comes running away behind a car and the automatic braking system takes action in spectacular fashion. An exciting experience with a great shock effect. The experience offers a unique point of view and takes viewers from preparation to the actual crash. Various perspectives are chosen on the track and in the car, giving the viewer a complete picture. A unique experience with a crushing end result. This 360 video provides insight into an experience that nobody wants to experience and demonstrates the importance of safe cars. The video was shown during the birthday event in Brussels to prominent figures from the car industry. The response was overwhelmingly positive and Euro NCAP is considering integrating the 360 ​​perspective standard into their tests.